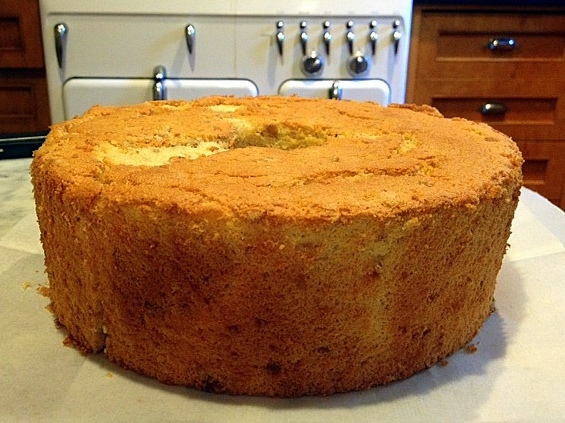 I've achieved sponge cake nirvana. 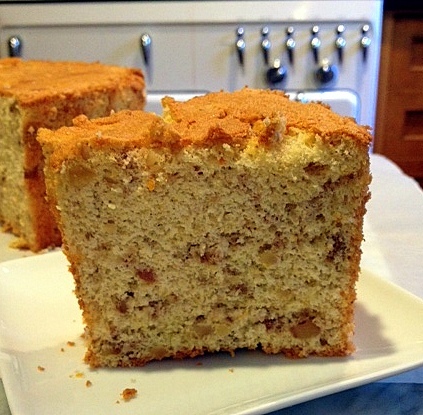 This is a light and moist sponge cake -- so delicious that you won't even notice the lack of butter and flour. 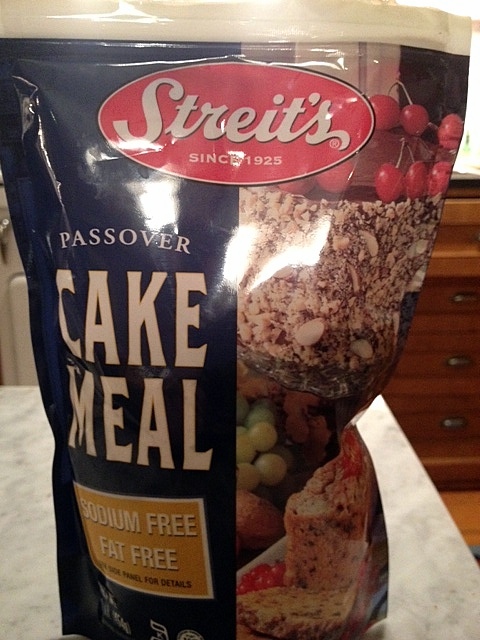 It is the perfect Passover dessert. After my two recent failures, I was especially pleased that this cake was a success. The recipe, handwritten on a page of an old calendar, was given to me by Arthur Schwartz who inherited it from his mother. 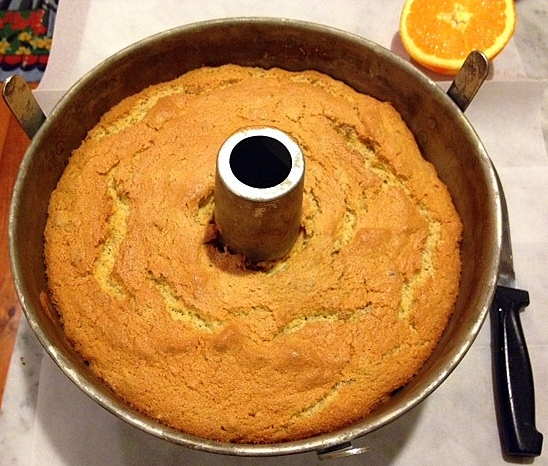 In addition to the wonderful texture, the cake has a lovely citrus note from the lemon and orange zest and juice. It's important to begin with room temperature eggs. If you've just arrived home from work and your eggs have been in the fridge all day, no problem. Just place them in a bowl and cover with warm water for a while while you prep the other ingredients. 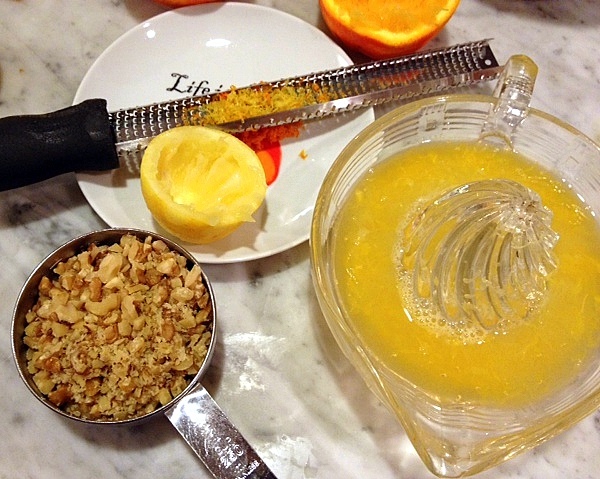 Chop the nuts (or chocolate) and zest and juice the fruit. 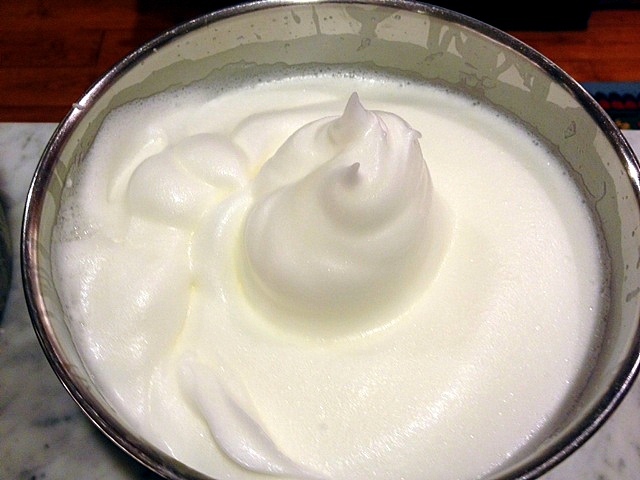 Measure out the cake meal and potato starch. Beat the yolks for a long time ("beat yolks good" says the recipe) until light in color, then add the sugar and beat the mixture even more until the yolks become very light in color. 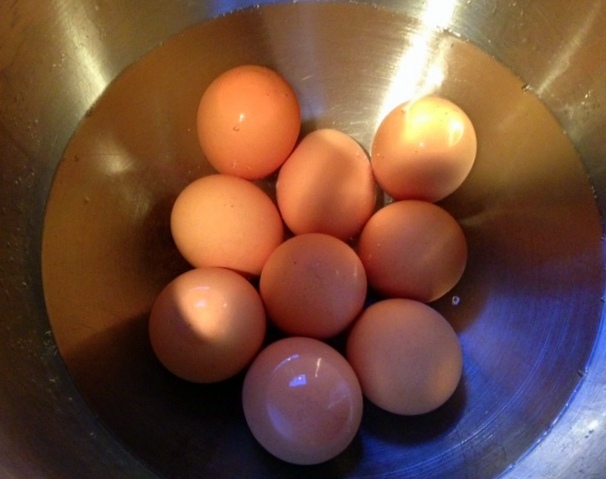 (Do not let the sugar and eggs sit in the bowl without mixing, for the sugar will "cook" the eggs and you'll end up with small bits of scrambled egg.) 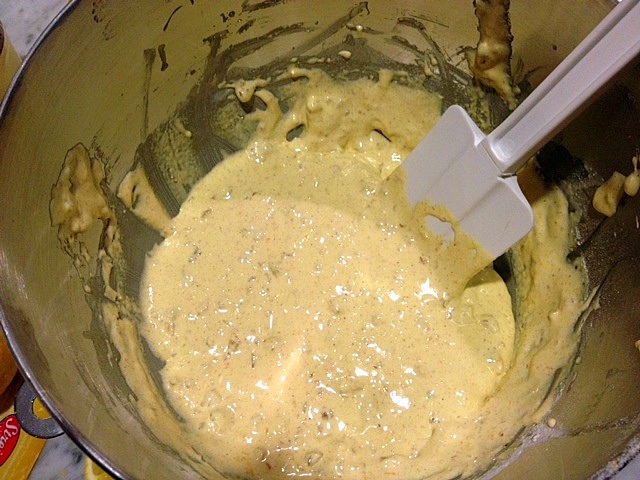 Mix in the citrus and the dry ingredients. 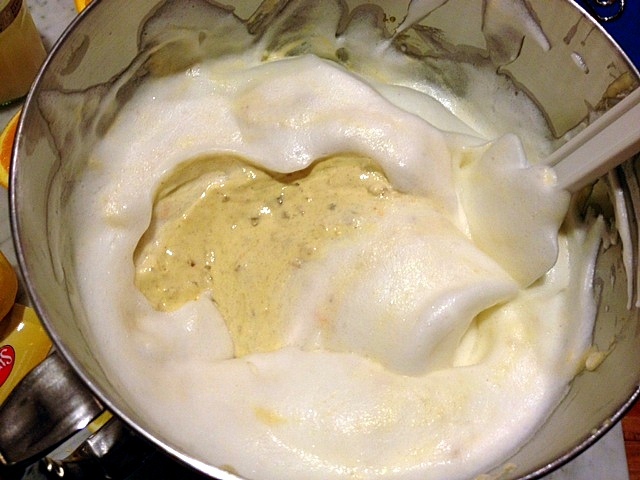 Carefully fold the whites into the batter, using a large spatula. Combine until there are no visible white streaks. 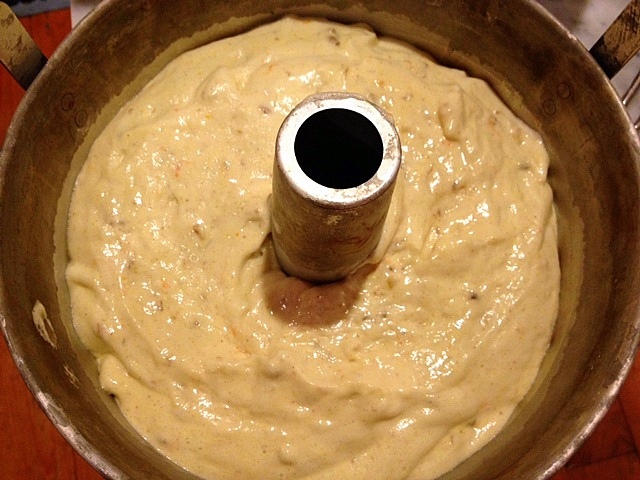 Pour into a 10-inch tube pan. No need to grease the pan, but based on my previous cake fail experiences, I put a round of parchment paper on the bottom for added insurance. (Not sure it was needed.) Smooth out the top and pop in the oven, which you've preheated to 325 degrees. You should preheat the oven for at least 20 minutes to ensure it reaches the proper temperature. When the cake is done, invert it until cool. (My pan has "legs" but if yours doesn't, simply place it atop a wine bottle.) Then turn upright and run a knife around the outside edges to loosen the cake from the pan. 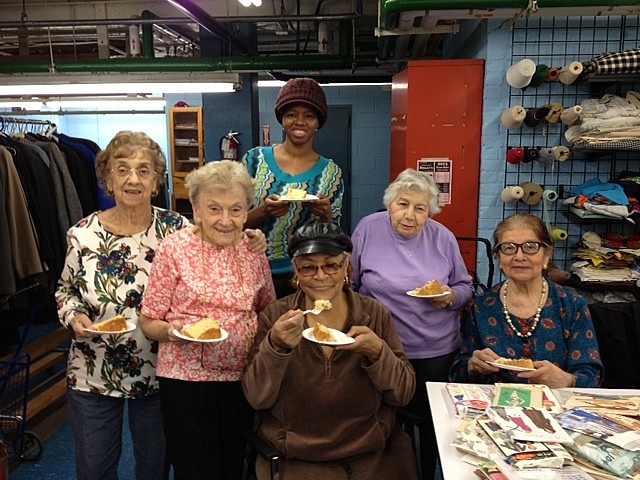 I shared the cake with the ladies at Henry Street's Home Planning Workshop, below, where Ruth Taube, second from left, has been teaching knitting, sewing and crocheting to neighborhood residents since the 1960s! She's in her late 80s and still going strong. The recipe is below. I used about one cup of chopped walnuts. Next time, chocolate! 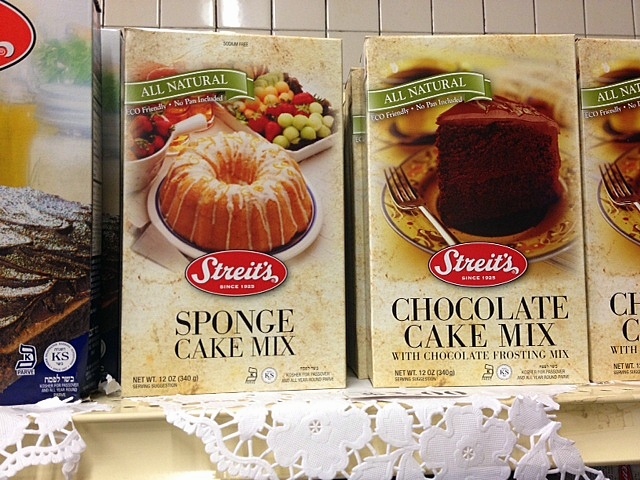 The "cake flour" refers to cake meal, available this time of year. 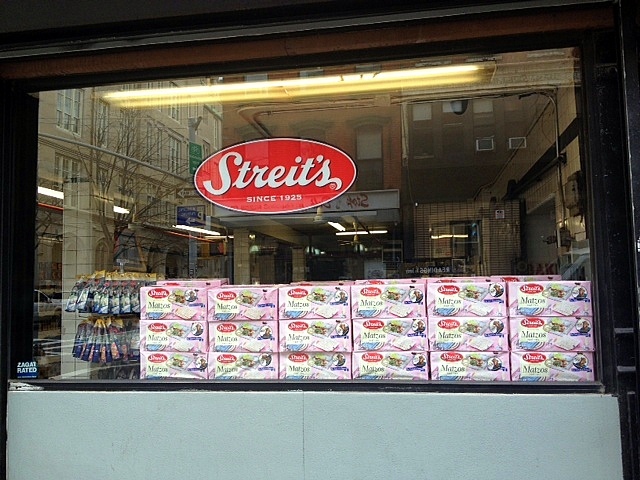 I'm lucky enough to work on Manhattan's Lower East Side, home of the Streit's matzoh factory and snapped these pictures (exterior of the shop, Passover cake mixes and matzohs hot off the press) when I purchased the cake meal there. Please come tonight to Congregation Beth Elohim for a conversation with Edgar M. Bronfman, Jan Aronson and Rabbi Andy Bachman about The Bronfman Haggadah. Bring us a cake. Would love to see you. 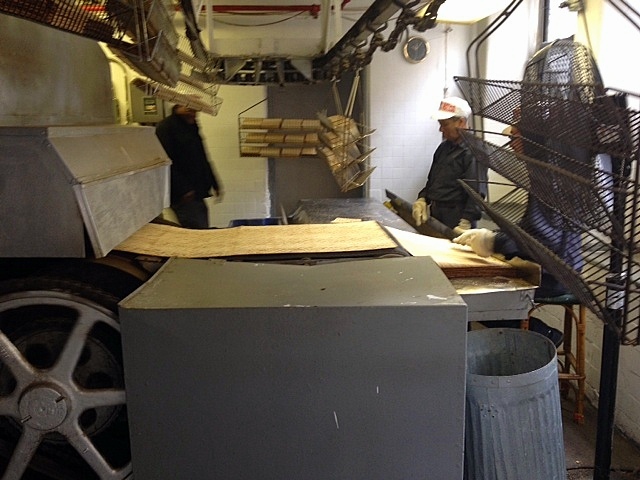 The Gefilteria will be there with yummy gefilte fish snacks. Slope Cellars with wine. And books for sale. Please come and bring Paul! I would love to go, Feisty One, but alas I have theater tickets. I'm sure your event will be a smashing success! Have you heard of this site called Handwritten Recipes? It's a used book dealer who finds recipes(among other things) in books he gets. Wow! Thanks for the tip. 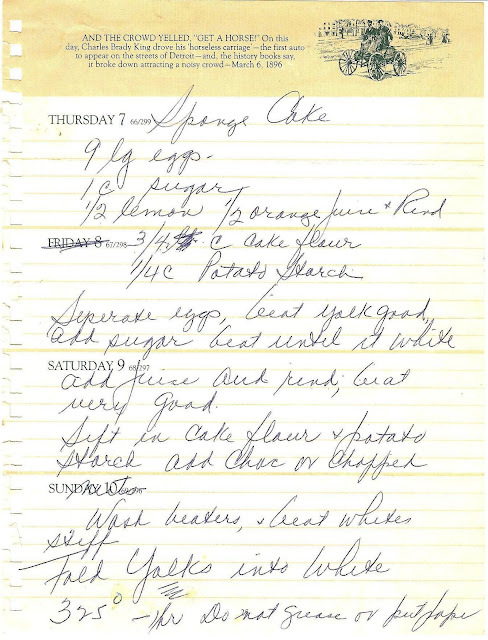 Really interesting (and kind of amazing that so many handwritten recipes get left in books). I'm so glad you had a successful cake! And this looks great! Thanks, Abbe. I was about to turn in my Kitchen Aid. Luckily, I was redeemed. I got your site from a friend and was happy to see this recipe but cream of tartar is NOT Kosher for Passover. Ah, you're right! Cream of tartar is really not necessary, though. I just use it for added insurance ; )). Instead of cream of tartar, save about 2 tablespoons of sugar from the yolks and beat gradually into the whites. They will stabilize the whites. Love this. Streits family lived a few blocks away from my childhood home, Manhattan Beach. I lived in Manhattan Beach too! Great neighborhood! What's your name? I'm Kathy Kay!